OneUnited Bank and BMe Community are sponsoring the eighth annual financial literacy contest for youth between the ages of 8 – 12 years old. Simply either write and submit a 250 word essay or create and submit an art project about what you learned from the book “I Got Bank!” (or from another financial literacy book available in your library or home) and how you can use what you learned in your life or the life of your family. You must have your parents’ permission to participate. Your essay or art project may be published by OneUnited Bank and BMe Community. All submissions must be postmarked or emailed by June 15, 2018. (Children of employees of OneUnited Bank or BMe Community are ineligible to participate.) Winners will be selected by OneUnited Bank in our sole discretion. Ten (10) winners will receive a $1,000 savings account by August 31, 2018 (with cooperation from parents). No purchase required. Awards are subject to 1099 reporting. To submit your essay or art project, see details below. Please see our 2018 Flyer. To participate, click here to fill out the form and have your parent(s) approve the form. Submit your 250 word essay or a PDF of your art project by June 15, 2018 explaining or showing what you learned from the book “I Got Bank” (or from another financial literacy book available in your library or home) and how you can use what you learned in your life or the life of your family to OneUnited Bank, Financial Literacy Submission, 100 Franklin Street, Boston, MA 02110 or online. Winners will be announced by August 31, 2018. Hi Jonah, we are so happy to hear you want to join the OneUnited Bank family. We currently do not have any branches in your area, but you can still bank with us using our online banking products. We offer everything from checking and savings accounts to secured credit cards and even certificates of deposit. Where can we purchase the book? Hi Lionel, thank you for reaching out to us. Unfortunately I Got Bank is sold out and is being restocked. You can download the Kindle version of the book for less than $10 and use an app to convert it to your computer, or you can obtain any financial literacy book for the contest.The book has been restocked and is now available on Amazon. I am so grateful for the bank to sponsor this project. Black children almost never get taught about wealth building. Our children need to be taught about this (business ownership and passive income.) from the cradle to the grave. I have 3 accounts with One United Bank. Virgil W. Hill Jr..
Hello!I work with a nonprofit in Miami-Dade that provides a safe and fun environment for local students after school. We have been introducing financial education into their after school lessons and I would love to incorporate this into our programming. I would appreciate if someone could get in touch with me on how to do a mass submission.Thank you! Thanks for your inquiry Hannah. Mass submissions are fine! We have schools and after-school programs use our financial literacy contest and submit all their children’s work in one binder. We read/review each submission.Each child must have a separate page that includes their essay/art and their parent’s name, email address and cell phone number and the youth’s name, school, date of birth, phone number and address. We contact the youth’s parent to confirm their approval before we finalize the winners. To date, all parents have confirmed their approval and are thrilled their child has been selected. See www.oneunited.com/book for more information on the contest. As a Jamaican, I want all my 4 kids to join this bank. Can I start a college fun for all my kids? Hi Randean. We appreciate you reaching out to us and your interest in banking with us. Supporting Black-owned businesses is important across the globe, but we are a community bank and are not yet able to support international banking. As we grow, and evolve this may become possible for us. We appreciate your passion, and hope that while we may not be the bank to address the need internationally, that some entity does, and soon. My primarily white church is hosting a "Soul Food Dinner" fundraiser for the new Stroutsburg Sourland African American Museum in New Jersey. It will be the first museum devoted to the rich history of Black Americans in this region. The community gathering will be open to the community so we expect a good mix of Black people as well as white aspriring allies. Both groups I would love to introduce OneUnited to. I opened my account a few years ago and still have never met one single person (Black or white) who has heard of this wonderful institution. Please let me know who can send me 150 brochures or pens or business cards or anything that will help me amplify your name at the dinner. If this dinner is successful the plan is to "take it on the road" and share the template with other churches in the area, the state, the country. Hi Joyce, thank you for reaching out to us. Unfortunately I Got Bank is sold out and is being restocked. You can download the Kindle version of the book for less than $10 and use an app to convert it to your computer, or you can obtain any financial literacy book for the contest. The book has been restocked and is now available on Amazon. Is it OK to exceed the limit of 250 words? My daughter wrote her essay and turned it in with 299 words. Is that OK? Hi Victoria. It's absolutely okay if your daughter's essay is a little over 250 words. We look forward to reading her submission. Thanks Aderoju for reaching out. As long as you clicked submit you should be all set. Please let us know if you have any other questions. Thank you .I love to get emails hope I am approved . Hi Belinda, thank you for reaching out. 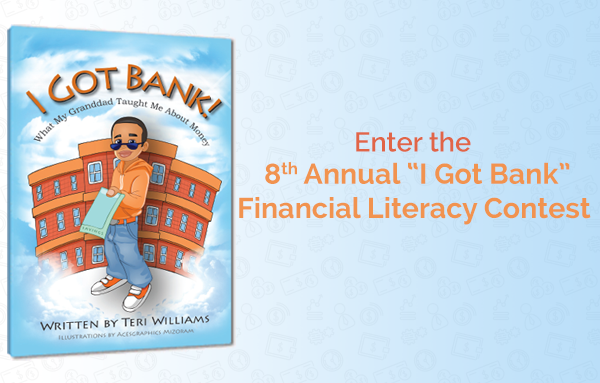 Our annual "I Got Bank" Financial Literacy Contest will be happening again this upcoming year! Please stay tuned on our website for updates.